Why not Chess, Checkers, or Backgammon? A flat board with six pockets on each side and two large stores on the ends makes up most of what we see at the big-box stores. While retailers have kept Mancala on the store shelves in recent years, the quality of the boards has decreased. However, economies of scale and low-cost materials have allowed a low-cost Mancala game to be available to millions. As we explore the world of Mancala, we will bring our readers where to find the very best games. 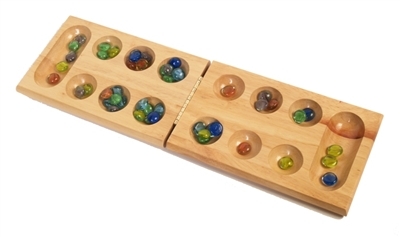 If you have found a game or manufacture a Mancala style game please be sure to post it here.